Extreme wealth has been on the rise across the world in recent decades. The number of billionaires, and the wealth they hold, has increased rapidly, in conjunction with the rise of inequality. Forbes’ latest ranking of the world’s richest included a record number of 1,826 billionaires, in large part thanks to the rapid increase in the number of billionaires from emerging markets. Who are the world’s “superrich,” and how did they acquire their wealth? In recent years, a few studies have tried to answer this question. In 2013, Chicago Booth’s Steven N. Kaplan and Stanford’s Joshua Rauh looked at Forbes’ list of 400 wealthiest Americans in the years 1982, 1992, 2001, and 2011, and compared billionaires in the U.S. to billionaires in the rest of world1)Kaplan, Steven N. and Joshua Rauh. 2013. “It’s the Market: The Broad-Based Rise in the Return to Top Talent.” Journal of Economic Perspectives, 27(3): 35-56.. Among other things, they found that in the U.S. and elsewhere, the number of billionaires who inherited their wealth and businesses has declined significantly since the 1980s. Whereas much of the new wealth generated in the U.S. came from technology and finance, they found, outside the U.S. natural resources (most notably mining and energy) played a much larger role. A new paper by Caroline Freund and Sarah Oliver of the Peterson Institute for International Economics (PIIE) also uses the Forbes billionaire list to compile a comprehensive database of the world’s billionaires and compare the sources of their wealth2)Freund, Caroline and Sarah Oliver. 2016. “The Origins of the Superrich: The Billionaire Characteristics Database.” Peterson Institute for International Economics Working Paper Series 16-1. “The idea was that by looking at who the wealthy are and how they made their fortune, you can get a sense of the business climate and what activities are most well-rewarded in different countries,” Freund, a senior fellow at PIIE and a former World Bank, IMF, and Federal Reserve economist, recently told ProMarket. The paper, one of the most extensive attempts yet to study the origins of the world’s superrich, relies on Forbes’ World Billionaires list, which lists all individuals with a net worth over $1 billion each year, between 1996 and 2015. It goes on to distinguish between billionaires across six geographical regions: Europe (which Freund and Oliver divide into high-income and low-income countries), Latin America, Sub-Saharan Africa, the Middle East and North Africa, South and Central Asia, and East Asia (which is also separated by high and low income countries). Anglo countries—the U.S., Canada, Australia, and New Zealand—are grouped in a category of their own. Freund and Oliver divided billionaires into five sector categories—resource-related, new, traded, non-traded, and financial—and categorized them by inherited wealth and self-made wealth. The latter category, in turn, is divided into subcategories such as founders, executives, finance, and politically-connected/ resource-related billionaires. 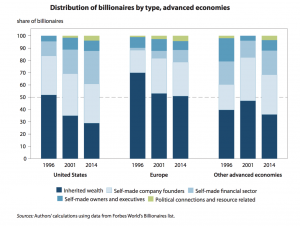 What Freund and Oliver found is that the number of self-made billionaires around the world overtook inheritor billionaires, with self-made wealth accounting for nearly 70 percent of billionaire wealth in 2014, in large part thanks to a rapid growth in the number of self-made billionaires in emerging markets and in the United States. 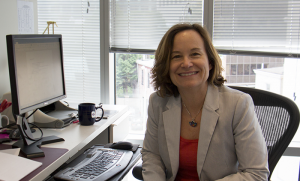 In her recent book Rich People Poor Countries (Peterson Institute for International Economics, 2015), which uses the same dataset as the paper, Freund analyses hundreds of emerging market billionaires. The paper’s most surprising finding, however, relates to the U.S. 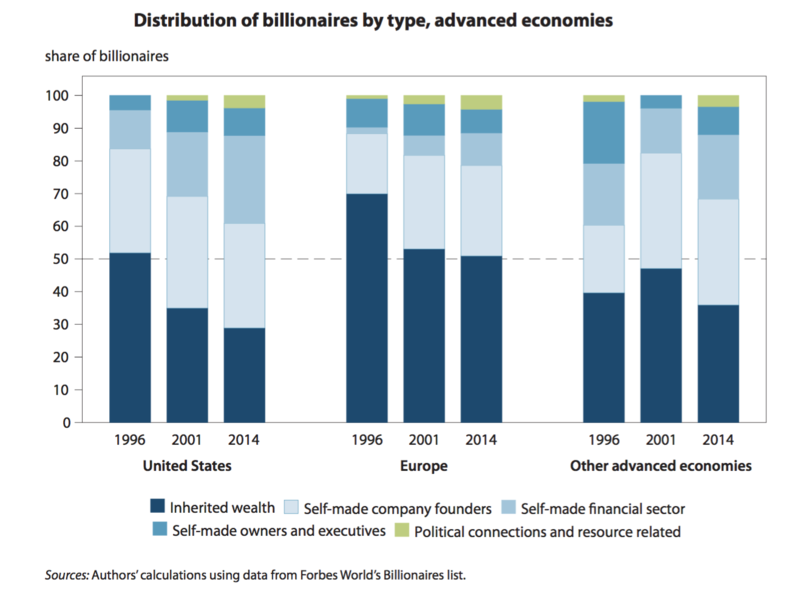 While in Europe inheritances still account for more than 50 percent of all billionaire fortunes, the U.S. has seen a rapid rise in the number of self-made billionaires, thanks to the incredible growth of the financial sector. The growing financialization of the American economy has been hugely important in the creation of extreme wealth in the U.S.: 27 percent of U.S. billionaires worked in finance in 2014, compared with 10 percent in Europe and 20 percent in non-European developed countries, according to Freund and Oliver. “In the U.S., extreme wealth is increasingly tied to finance,” says Freund. Over 40 percent of the growth in the billionaire population in the U.S., according to Freund and Oliver, is attributable to growth in the financial sector, whereas in Europe most of the growth in wealth was provided by the traded sectors, and East-Asia, “home to the large-scale entrepreneur,” experienced a sharp rise in the number of billionaires who founded their own companies. Overall, according to the paper, wealth creation is much more dynamic in the U.S. than in Europe. The U.S. has a higher share of billionaire founders than Europe, and while fifty percent of European billionaires inherited their wealth, the share of American billionaires who inherited their fortunes is a little less than a third, and less than 10 percent of inherited U.S. fortunes are fourth generation or older. The median age of European companies associated with billionaires is 61, compared with 42 in the U.S. Even so, says Freund, “both pictures, in the U.S. and in Europe, aren’t pleasing.” While wealth creation in the U.S. is more dynamic, Freund and Oliver find evidence that rents might be higher in the U.S. than in Europe. There are two potential ways in which the total wealth of billionaires can grow, explains Freund. One is an increase in the number of billionaires (the extensive margin), and the other is that existing billionaires are getting richer on average over time (the intensive margin). In all the regions examined by the paper, growth in extreme wealth was largely driven by the extensive margin, meaning by the addition of new billionaires. But in the U.S., unlike other advanced countries, nearly 20 percent of the growth in billionaire wealth was driven by the intensive margin. European countries, especially the U.K., also experienced a rapid growth in the financial services sector. What makes the American finance sector unique, in terms of wealth creation and rents? “I think a lot of it has to do with the hedge fund sector, which really hasn’t produced billionaires anywhere in the world like it has in the U.S.,” says Freund. 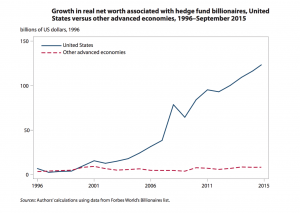 Hedge funds, according to the paper, played a very large role in creating extreme wealth in the U.S. in the last two decades. In 2015, hedge funds accounted for 22 percent of wealth in the U.S. financial sector, compared with 10 percent in 2000. Over 80 percent of hedge fund billionaires in the world are from the U.S. 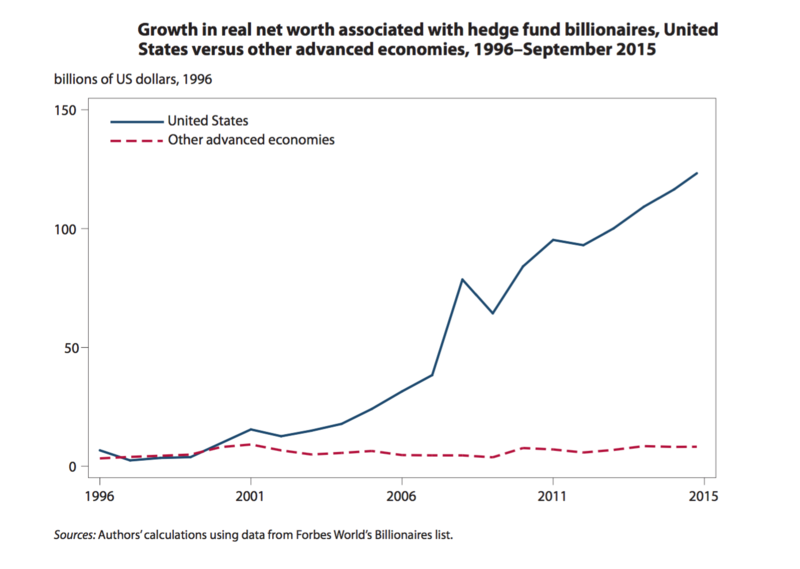 While the total real net worth of hedge fund billionaires stayed relatively constant in most advanced economies between 1996 and 2015, in the U.S. it grew from less than $25 billion to $120 billion. 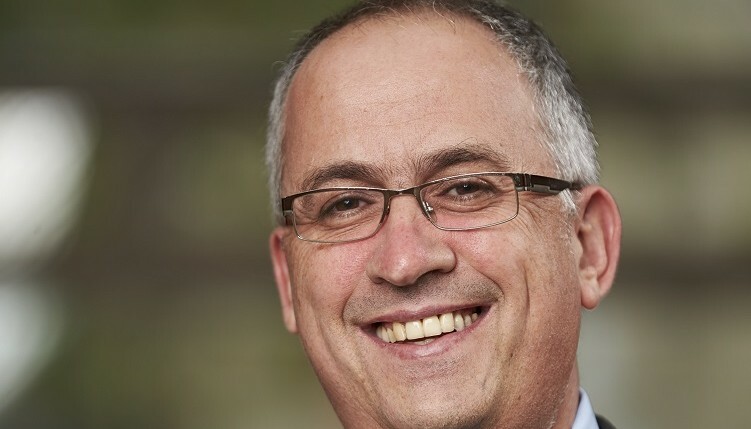 “I don’t think it has to do with resources, but with the incentives in the financial sector in Europe and the U.S., and the way people play the game,” says Freund. Freund, of course, is not the first to point to an increase in rents in the U.S. economy, partly driven by rapid growth in the financial sector. Nobel laureate Joseph Stiglitz has defined the financial industry3)Joseph E. Stiglitz and Linda J. Bilmes. “The 1 Percent’s Problem.” Vanity Fair, 2012. as “the rent-seeking sector par excellence.” In a 2015 paper, Jason Furman and Peter Orszag pointed4)Furman, Jason and Peter Orszag. 2015. “A Firm-Level Perspective on the Role of Rents in the Rise in Inequality.” Presentation at “A Just Society” Centennial Event in Honor of Joseph Stiglitz at Columbia University to the possibility of “consistently high supernormal returns” in finance and in tech, and CEPR’s Dean Baker identified the financial sector as one of four major areas that experienced a growth in rents5)Baker, Dean. 2015. “The Upward Redistribution of Income: Are Rents the Story?” CEPR working paper..
Are We All Rent-Seeking Investors? Productivity, Inequality, and Economic Rents Who are the 30 Worst Brokers in America When Measured By Misconduct? 1. ↑ Kaplan, Steven N. and Joshua Rauh. 2013. “It’s the Market: The Broad-Based Rise in the Return to Top Talent.” Journal of Economic Perspectives, 27(3): 35-56. 3. ↑ Joseph E. Stiglitz and Linda J. Bilmes. “The 1 Percent’s Problem.” Vanity Fair, 2012. 5. ↑ Baker, Dean. 2015. “The Upward Redistribution of Income: Are Rents the Story?” CEPR working paper. 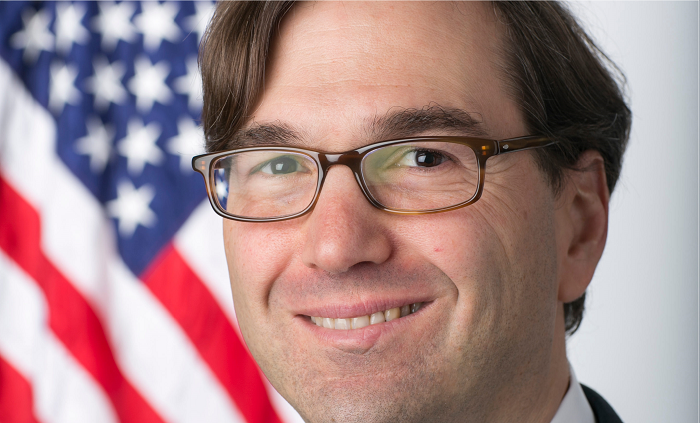 « A Moment To Reform Accounting Rulemaking?